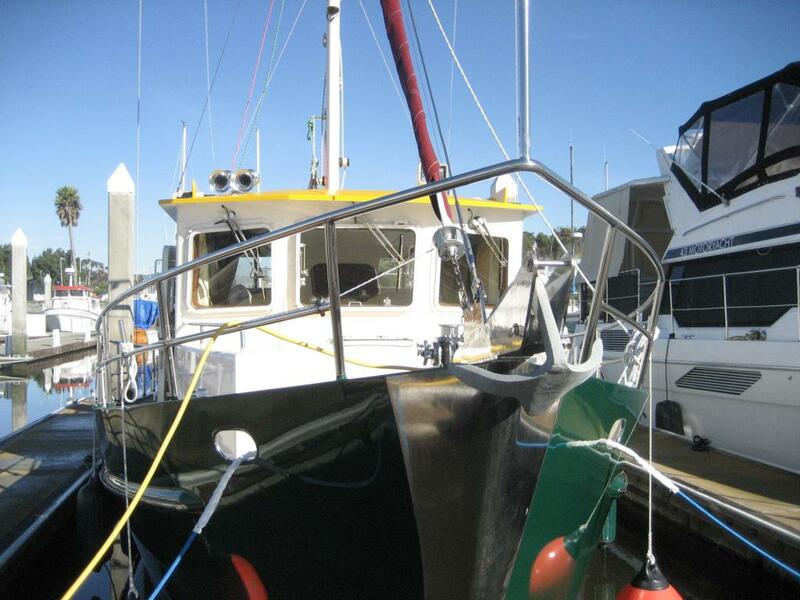 I am looking at trawlers while I wait for someone to buy my sailboat. Now for my sailboat, which is 44' and 38000#, I have an 80# Manson Supreme on 300' of 3/8 chain. Overkill I know, but I sleep well at anchor, especially when the wind kicks up at o-dark-thirty. What I have noticed with most trawlers under 50' is that they all seem to have undersized anchors (35-45#) in my opinion. It seems that trawlers have more windage than a sailboat, so why a smaller anchor? As we know, anchor size recommendations by manufacturers are not very helpful. So, I'm just looking for opinions without igniting a big anchor controversy. As for igniting controversy, I'm afraid you lit that fuse when you titled your thread. The answer to your question will depend somewhat on the type of anchor and the configuration of the boat in terms of height, width, weight, etc. We have a Rocna 20 (44 lbs) for our 36' 30,000 pound cabin cruiser. This was the size of anchor recommended by Rocna for our boat when I talked to them in New Zealand back in 2007 or 6 about their anchor, and it is the anchor we subsequently bought. For a 40' boat the Rocna 20 could be sufficient but I would probably be more inclined to go with the Rocna 25 (55 pounds) if the pulpit could accomodate it. On the other hand, we also carry a Fortress FX23 as a stern anchor but it's sized to be the main anchor for our boat should we want to use a Danforth-type design under some circumstances. This aluminum anchor weighs about 15 pounds if memory serves. So the design of an anchor plays a significant role in determining the ideal size/weight for a particular boat. In my opinion there is no one-size-fits-all formula for determining the optimal size of an anchor for a particular boat. I would asses the windlass and look to the bow roller and simply decide which of the common anchors is the LARGEST size that can comfortably be fitted. Plan on stowing an extra anchor of a different type , for different bottoms. The best of course is a set of rollers so 2 anchors can be carried at the same time , and no effort is required to select the one you think best. Actually the manufacturer's charts are pretty good; buy the one where your boat size is at the very bottom end of the range given. Fact is, a lot of weekend warrior pleasure boaters and/or marina hoppers don't take their ground tackle seriously. Before I take interest in what anyone has on their boat, I want to know them first. The marinas may not be the best place to look at boats for their anchor size. Many marina boats only anchor out occasionally and then in fairly decent weather. If you can find boats that anchor out almost all the time then you have a good base to determine the proper size.
" I have repeatedly seen sailboats drag with 45 lb CQRs"
IMO - Go with a Fortress FX in the next size larger than recommended for your boat. The considerably lightweight but very strong metal comp makes it easy to handle... so size larger creates no problem. It's several design improvements to Danforth (which it is modeled after) makes it well applicable to most bottom conditions. A fairly long chain (10' minimum - longer the better) to rope configuration helps keep its shank down in low angle to sea bed so the flukes dig in. Full chain rode even better! I would always have an alternative anchor on hand that could be used as a main anchor if needed. Marin has it right. A 55lb Rocna would be my choice for a 40'er and maybe one size bigger if you live aboard and stay on the hook in snotty conditions and absolutely can't afford to drag. And while we are on the topic, nothing beats an all chain rode, probably 3/8" G4 for that size boat and anchor. And it look to me like lots of powerboats in that range are simply delivered with a 35-lb Delta (if that big)... because that's an easy solution for dealers. Without regard to whether it's suitable or not. The original buyer must then be expected to replace that with whatever floats their boat. I've found the tables to be OK, but at the same time I'm happy to make my own assessment about what windage might add to our particular situation... so starting with manufacturer's recommendations and adding some zen math from there usually works for me. OTOH, I've also self-imposed a total weight limit on what I think I can bring aboard manually -- if the electric windlass craps out. I consciously decided I'm not mounting a 75-lb anchor (the next size up from what I've got now) because I don't want to try to dead lift 90-lbs or so (counting the last bits of chain) anymore. And that weight limit also makes the Fortress models very useful, too. In our case, as our main spare. I have the 60 pound Manson Supreme for my 40...which I refer to as a small 39 footer based on waterline length and weight. Manufacturers have a responsibility to get their recommendations right, and the bigger the recommended anchor the more $ it sells for, but you might go up a size if your boat is heavier/has greater windage than average. Angus99 is right,for controversy, discussing ground tackle is just short of discussing wedding tackle. If you buy a Super High Holding Power (SHHP) anchor it's silly to go oversize. You're buying holding power. And high holding power in the widest range of circumstances. Many low performance anchors will be high performance if oversized compared to typical anchors. The Claws are very flexable. Accommodate all scopes, chain or no and most any kind of bottom. A 35 lb Manson Supreme or a 70lb Claw will both provide holding power for a 40' boat. The Claw will cost less and both will not require much chain. But yes I'd say your 80lb MS is supreme. Should provide supreme performance for your boat. But a 45 lb MS would do the job just as well I think. I use both 15to 20lb high performance anchors and 25 to 35lb low performance anchors for my 30' boat. The flexibility to handle almost any situation is far better than the ability to score top dog at any one thing. Most anchor tests only test under ideal or typical conditions. overkill...maybe...but compared to all the other knuckleheaded discussions over hoses, hose clamps, quarter buttocks lines, riding sails and all the other things most don't really understand....going overkill on something I CANT see doing its job and just assuming what will happen...a little overkill is something I can live with after a lifetime of risking my life or reputation in boating related things. Can't imagine you risking your reputation. I think I'll add my thoughts that everybody commenting regarding the smallish ground tackle on most boats is 100% correct. Most boats don't get used much. Most that actually get used rarely anchor out. I've never ever heard anybody say they wished they had a smaller anchor, but I have heard the opposite. My experience (with Danforths and claws) is that manufacturers' recommendations are sufficient (no failures) if the anchor type is suitable for the bottom type, the anchor is properly set, and there is minimal fetch. A "storm" anchor, however, needs to be bigger/heavier. Regardless, extreme conditions can overcome any of man's creations. I sail in protected waters, so recommended sizes are sufficient. "You're buying holding power. And high holding power in the widest range of circumstances." I believe you are purchasing advertising hype and very very select "anchor tests". There is NO majic in a new and improved lump of steel. I much prefer to carry a number of good sized proven anchors , with line , ready to deploy than a highly hyped watch fob. Anchor weight, overall anchor size, and anchor design are three very important anchoring (ground tackle) factors. Place all three factor-conditions together and it clearly appears to me that Fortress FX anchors win the prize for best overall anchor. Why??? - Well, because: FX anchors have great design to well handle most bottom conditions and are built tough/strong with good materials. FX anchors each offer easily accomplished design alterations. And... very importantly... FX anchors are extremely light weight - so it is easy to handle larger models that can take care of conditions experienced per boat size; without placing undue weight on an anchor handler, over weighting a protruding pulpit, or over taxing any other location aboard boat. Also... if desired, FX anchors can be disassembled for compact storage inside boat confines.